Insert page 8 The messages of support which the Burlington Committee has received have all emphasized this point. Mr David Lilienthal, Chairman of the U.S. Atomic Energy Commission, said in his statement, and I quote, "an informed and independent public opinion, developed within the communities of America, is essential to the wise control of this great force so that it shall in the end strengthen and not weaken the democratic way." 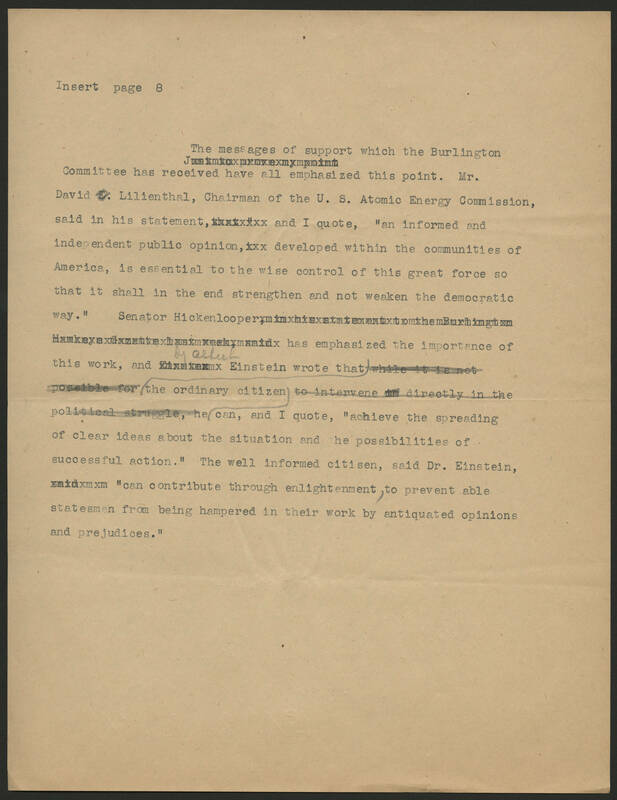 Senator Hickenlooper has emphasized the importance of this work, and Dr. Albert Einstein wrote that the ordinary citizen can, and I quote, "achieve the spreading of clear ideas about the situation and the possibilities of successful action." The well informed citisen, said Dr. Einstein, "can contribute through enlightenment, to prevent able statesmen from being hampered in their work by antiquated opinions and prejudices."